Voel u thuis in St Petersburg in ons zeer compleet ingerichte appartement met een prachtig uitzicht over de Fontanka. Het huis is gesitueerd aan de westkant van het stadscentrum en is een uitstekende en interessante uitvalsbasis voor een bezoek aan deze boeiende stad. Met behulp van onze goede kennis Andrej kunnen wij verschillende diensten aanbieden, zoals visa-uitnodigingen en registratie, transfers en persoonlijke tours. Voor de meer informatie kunt u onze eigen website spb-apartment.nl bezoeken. We are a Russian-Dutch couple living in Amsterdam. In 2001 we bought this apartment to stay connected with St Petersburg and to have the possibility of visiting our family, staying in our own place. Also we found attractive the idea of sharing the apartment by short time renting, since we like to travel ourselves and are used to rent similar accommodations. We get many questions about the distance to the main attractions of the city. The apartment is situated in de West part of the city centre so not in the very centre. St Petersburg is a large and widely planned city: wherever you will stay you won't be able to visit it all, even when you stay a couple of weeks. In our opinion visiting a city (or any place in general) becomes much more interesting by not following the main crowd but allow yourself some side walks. In this respect the apartment is situated absolutely perfectly: it gives you a unique opportunity to explore St Petersburg, the atmosphere of the 'real' city-live but with the main attractions on a walking distance. The apartment offers a splendid corner view over the Fontanka river. With decorating the apartment with antique as well as modern furniture we tried to create a pleasant and homely atmosphere which distinguishes our apartment from the average. Through our good acquaintance Andrei, who speaks English and Dutch, we can arrange several services as visa invitations and registrations, taxi transfers and personal guiding tours. In the summertime you can arrange a tour in a small boat just opposite the house. aan te sluiten op Ipod etc. een mooi appartement die van alle gemakken is voorzien. Ontvangst was geweldig. Een goede uitvalbasis om Sint Petersburg te bezoeken. David T.Where do you live? Huge apartment with plenty of furnishings and Kitchen items. Beautiful view of the channel and plenty of light. This apartment had everything the too of us needed, Father and Daughter. Easily accommodates 4 people. 24hr grocery and liquor store close by. Try the nearby Beer House Staff pub, friendly people and open until 6 am everyday. The metro stop is a long walk, we never used the metro, either walked to Central St Petersburg, or took Uber which was inexpensive. Good information sheet from the owner, helped us significantly. Julia was there to welcome us, and see us off, she was very helpful. Be advised, no elevator with 3 long flights of stairs to get to apartment. Thank you! We spent 5 days in St. Petersburg and we had a great time there. The house was perfect. It was clean & comfortable. Although it isn't closed to the centre, this gave us the possibility to walk and "taste" the town from different points of view. If you feel a voyager and not a tourist this house is perfect for you!!!!! We also thank Eltjo and his partente for having been so helpful & nice. This is a really nice apartment. We were a family of thee who stayed for eight nights, and the apartment created an excellent base for our visit to St. Petersburg. The apartment is located in a residential neighborhood a bit outside the beaten tourist tracks, which we found to be nice. We took the tram, the metro or a taxi or walked. That worked very well for us, and we did not get it wrong once in spite we do not speak Russian. The apartment is recently tastefully renovated with modern appliances including an excellent wifi connection. 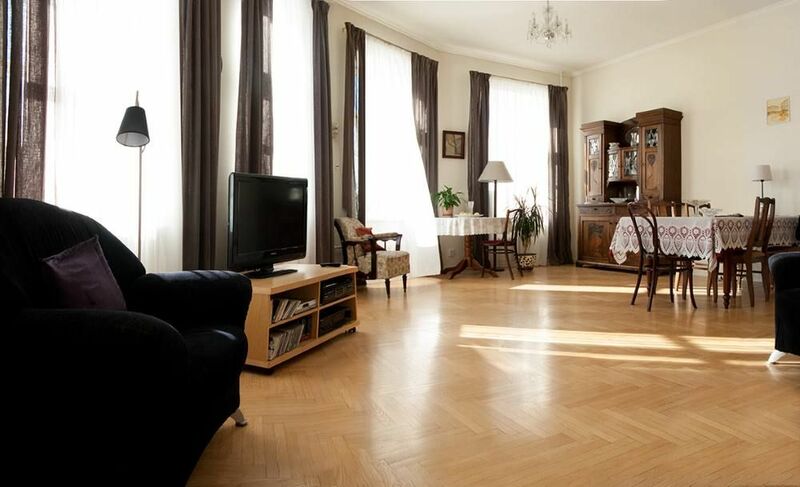 The apartment is light with high ceilings and with a beautiful view over the Fontanka Canal. We stayed during the white nights and that added an extra special dimension to the stay and to the view from the apartment at night. The owner was excellent. He had organized our pick up from the airport with a stop over at a large supermarket so we could stock up on our way to the apartment. He had also organized an excellent guide for us with whom we had three fine tours in and around St. Petersburg where we saw and learned a lot, not only about history, art and culture but also about modern day St. Petersburg. It was an excellent stay and we will not hesitate to recommend the apartment to other travelers. The entrance to the apartment and the main stairwell reminded us very much of old Edinburgh flats – stone stairwell with pairs of flats at each level. The apartment itself, was large, spotlessly clean and very well appointed. The ‘meet and greet team’ were charming. They spoke English and were able to explain many local matters to us. The location close to a bus stop gave easy access into the centre of the city or to the Metro. There were several small local shops nearby and the people in them were most helpful to us. The owner’s agent met us from a hotel near the airport, and took us back at the end of our stay. The charge for transport was reasonable, and included bringing our cases up and downstairs. The kitchen was modern and well provided with gas oven and hob, double sink and electric fridge/freezer. There was also a dishwasher (which we did not use) and an efficient washing machine and internal drying area (which we did use). The salon/dining room was open-plan from the kitchen and contained comfortable armchairs and sofa, coffee table and adequate numbers of dining chairs. There was a splendid ‘Art Nouveau’ (‘Modern’) cabinet (used for crockery and fine glasses) which I would happily have had in my own home. The main bedroom was very large and the wardrobe space was excellent. The ‘king size’ bed was just that – spacious, but just a touch hard for us. (an old couple). The twin bedroom at the back was smaller, but we found the beds more than adequate. The bathroom was excellent- everything worked – bath, shower, wash-basin and WC. The hot water was hot, and the shower pressure was good. The central heating was warm, quiet and effective. Wir verbrachten eine wunderbare Woche in Sankt Petersburg und die Wohnung hatte ihren Anteil daran. Alle Sehenswürdigkeiten waren zu Fuß erreichbar (nach 2 Tagen sind wir auf Straßenbahn und Metro umgestiegen(die Füße! )Nach vielen gelaufenen Kilometern war es jeden Abend wie ein echtes "nach Hause kommen". Man kann kochen- muss aber nicht: viele schöne Restaurants bieten Essen für jeden Geldbeutel. Der Transfer-Service vom und zum Flughafen hat ganz wunderbar geklappt und auch die Schlüsselübergabe. Der Vermieter hat uns in regem e-mail- Kontakt gut betreut und vorbereitet. Ich empfehle die Wohnung gern weiter. Vielen Dank Ines, froh zu hören daß ihr euch richtig zu Hause gefühlt hat! Voor alle kosten, zoals bed en handlinnen, schoonmaak, energie, wifi enz. is er een vergoeding van 25 Euro per persoon. NB deze kosten zijn nog niet verwerkt in de HomeAway calculatie. There is a fixed charge of 25 Euro a person for the hand- and bed linen, cleaning, energy etc. for the whole renting period. Please note: these cost are not yet calculated in the HomeAway price!